Thanks to John Van Hamersveld and Alida Post, to Bolton Colburn, and to Primo Beer and Longboard Vineyards wines! John Van Hamersveld (born 1941, Baltimore, MD) ranks as one of America’s leading multi-disciplined graphic artists and illustrators of his era. Known for his psychedelic patterns and vivacious color schemes, John received his education from the Art Center College in Los Angeles, CA in the early 1960s, which then gave way for him to launch his professional career as the art director at Surfer Magazine. 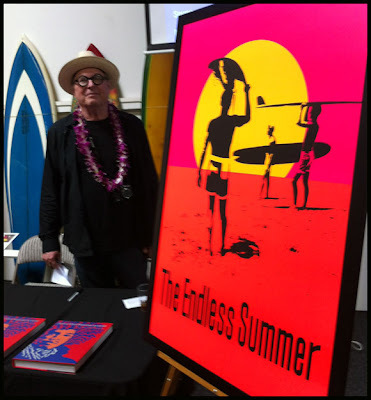 During this time, Van Hamersveld had an opportunity of a lifetime by designing one of the most recognizable and timeless film posters to date, The Endless Summer, directed by Bruce Brown in 1964. Shortly thereafter, he enrolled as a student at California Institute of Arts, later to become an instructor of art and design. This continued education, as well as the notoriety he garnered with the transcendent design of a burgeoning surf era, led to a vast array of tremendous opportunities, designing a number of concert posters for such artists as Jimi Hendrix, Jefferson Airplane, The Who, among many others. In the late 60s, Van Hamersveld assumed the role of art director at Capitol Records where he continued to add to his already impressive portfolio of graphics for famed musicians. During his running, he designed up to 300 album covers, the most notable of which being The Beatles’ Magical Mystery Tour and The Rolling Stones’ Exile On Main St. These iconic sensibilities and transformative designs he produced were beneficial in the conception of logos, typography, and complete graphic identities for such brands as Fatburger, Contempo Casuals, Gotcha, and JIMMY’Z. More recently, in an extension to graphic identity and dazzling homage, Van Hamersveld, as well as over 30 million people worldwide, have seen the culmination of his work on a grand scale, 1,500 feet high and 12 million LEDs bright, at the Fremont Street Experience in Las Vegas, NV. His work has also been featured in a number of exhibitions, including the MOMA in New York and the LACMA in Los Angeles. Today, the legacy of John Van Hamersveld’s 50 years of graphic design is embodied in the archives of his Coolhous Studio, presenting the past and future of his collective works, designs, and facades. Coolhous Studio will continue to create new works, as well as promote the relevance of Van Hamersveld’s illustrated creations in modern day society as being a radically transformational inclusion in the Americana art scene. It was a great event, thank you to our volunteers and attendees! I have in my possession a print from the 2009 Billabong Pipeline Masters by John Van Hammersveld. At the time of the contest, it was stated that only 500 were printed, and sold for $20.00 each. I have never seen any since then, and can find no information on them anywhere. Thus my question is, are these prints of any value, not that I'm going to sell it, but was just wondering.